Back when people in Seattle had great, expansive ideas, Jack Gordon -- at the time, a partner in the advertising agency of Williams and Gordon, director of publicity for Greater Seattle, and chief of the Athletic News Service of Seattle University -- came up with the great idea to Bridge Puget Sound. But Jack didn't want just one bridge. No, he wanted four... count 'em FOUR ... bridges. Here's a copy of Jack's proposal, typed on his portable "script font" typewriter for which he was well known. Think what our fair city might have looked like with all these bridges. I HAVE BEEN FOLLOWING THE PROS AND CONS ON THE PUGET SOUND BRIDGE DISCUSSION AND AFTER SOME INVESTIGATION AND THOUGHT, AN IDEA OCCURRED TO ME WHICH I PASS ON TO YOU GENTLEMEN FOR POSSIBLE REFERENCE TO THE COMMITTEES ON ROADS AND BRIDGES IN THE HOUSE AMD THE SENATE. IT IS MY CONVICTION THAT WHILE THE DUWAMISH WATERWAY BRIDGE WOULD MAKE FOR A SHORT ROUTE TO TACOMA, IT WOULD BE A COSTLY UNDERTAKING NECESSITATING THE CONSTRUCTION OF NEW AND IMPROVED HIGHWAYS AND ADDITIONAL BRIDGES, WOULD NOT BE A TOURIST ATTRACTION AND I FEEL SURE THAT SUCH A PLAN WOULD ONLY ADD TO SEATTLE'S ALREADY GREAT TRAFFIC PROBLEM BY PRODUCING A SOUTH-END BOTTLENECK AGGRAVATED AS IT BY THE BOEING AND INDUSTRIAL AREA TRAFFIC. 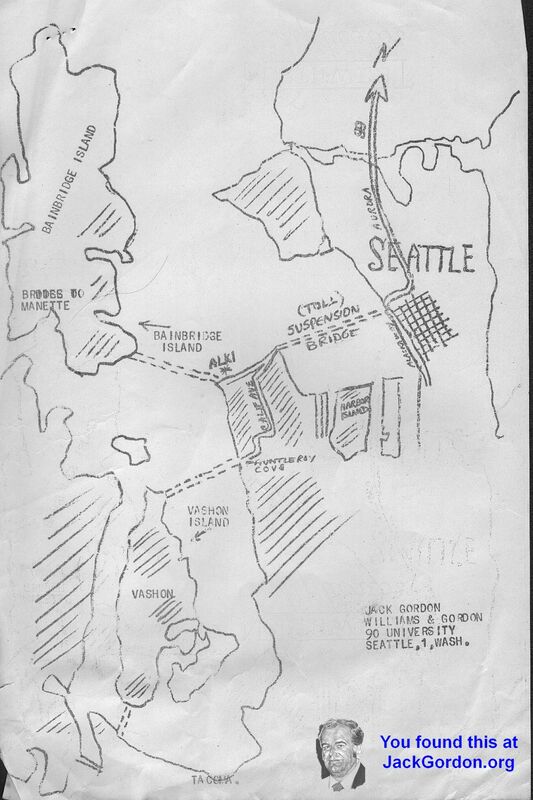 THE NORTHERN EXTREMITY OF THE DOWNTOWN SEATTLE BUSINESS DISTRICT COULD BE THE START OF THE SPAN WHICH WOULD CROSS THE BAY TO OLD LUNA POINT,UTILIZING AT THE WESTERN END AN UPPER HIGH-WAY LEADING TO WEST SEATTLE'S CALIFORNIA AVENUE AND A LOWER HIGHWAY MOVING TRAFFIC DOWN TO THE ALKI DRIVE. CALIFORNIA AVENUE.THEN, COULD SERVE AS A FEEDER STREET TO FAUNTLEROY AVENUE AND THE COVE WHERE A BRIDGE COULD BE CONSTRUCTED TO VASHON ISLAND AMD FROM THERE, A SHORTER SPAN FROM THE SOUTHERNMOST TIP OF VASHON TO THE MAINLAND NEAR TACOMA. THE ALKI DRIIVE WOULD THEN PROVIDE ACCESS TO A BRIDGE TO BAINBRIDGE ISLAND WHERE TRAFFIC COULD MOVE ON TO A SHORT SPAN TO MANETTE AMD BREMERTON. AT THE EASTERN END OF THE BAY BRIOGE, THE ENTRANCE PORTAL WOULD HAVE THE BENEFIT OF THE AURORA AVENUE AND BATTERY STREET TUNNEL FOR TRAFFIC TO AND FROM THE NORTH AND WOULD HAVE THE BENEFIT OF THE ALASKA WAY VIADUCT FOR TRAFFIC TO AND FROM THE SOUTH. THIS FACT STANDS OUT IN SUCH A PROPOSAL: A SUSPENSION BRIDGE ACROSS THE BAY WOULD DE A GREAT TOURIST ATTRACTION SIMILAR TO SAW FRANCISCO'S GOLDEN GATE BRIDGE AS WELL AS SERVING TO PROVIDE FASTER AND MORE CONVENIENT METHODS TO COMMUTE BETWEEN OUR PUGET SOUND CITIES. ILLUSTRATING THIS PLAN, I HAVE MADE A ROUGH SKETCH WHICH YOU WILL FIND ENCLOSED. THE PLAN HAS BEEN DISCUSSED WITH MAYOR POMEROY AND SEATTLE BUSINESSMEN OF MY ACQUAINTANCE AND WHILE WE ARE WELL AWARE OF THE RAMIFICATIONS SUCH AS A BOND ISSUANCE BY THE CITY, NEGOTIATIONS WITH THE STATE AND THE FEDERAL GOVERNMENT FOR MATCHING FUNDS, MOST EVERYONE IS IN AGREEMENT THAT SUCH A PLAN IS IN KEEPING WITH THE NEED FOR GREATER DEVELOPMENT OF THE NORTHWEST. THE PLAN IS PASSED ON TO YOU WITH COPIES TO A FEW OTHER MEMBERS OF THE HOUSE AND SENATE OF MY ACQUAINTANCE IN THE HOPE YOU WILL GIVE IT YOUR SERIOUS CONSIDERATION. CERTAINLY THE ENGINEERS OF THE TOIL BRIDGE AUTHORITY SHOULD CONSIDER THE FEASIBILITY OF SUCH A PLAN.